Test yourself in the comfort of your own home and determine your Nicotine or Cotinine levels quickly and easily when you order a home Nicotine test kit today. In as little as five minutes you’ll see the results - and our test kits are designed for accuracy and ease of use. If, after dipping the test strip into your urine sample, you see one line - you’re showing a positive test for Nicotine/Cotinine. Two lines means that your test is coming back negative. Any concentration of Cotinine of more than 200 ng/ml will indicate a positive test result. 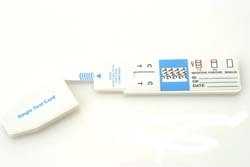 These 99% accurate test kits deliver results in minutes and are available at low factory direct prices from testclear.com. Order today and we’ll ship right away - peace of mind is right around the corner!